Is it ethical to ambush customers with gambling opportunities? On a business trip recently I took the opportunity to stock up on some cosmetic items at the airport including of course a gift for my mum with Mother’s Day on the horizon. At the checkout I was surprised to be invited to purchase a ticket giving me entrance to a draw to win back the cost of my purchases. Maybe there were posters advertising the draw but I hadn’t spotted them? I have mixed emotions about schemes that ensure a profit is made from offering prizes. I’m probably old fashioned but I remember the days when a brand or a business had to pay for the prizes they offered. Part of me admires the chutzpah in getting participants to fund the prize, as is the case here or with premium phone lines for example. Another, probably rather naive part, feels a prize that is offered as part of a marketing initiative should not come with an entrance fee. But quite apart from this it’s a matter of context. If it’s an often-repeated phone-in competition that is offered by your favourite TV show or a competition emblazoned on a pack of detergent or a chocolate bar it’s clearly sign posted to you, the consumer. This was different because it was asking me to participate in a gamble in a situation that was not obviously a gaming or betting situation. What if I had a gambling problem? What if I was trying to limit my exposure to such situations? This seemed a little like being offered a glass of wine in a sports shop, not something we’d expect to encounter and so not something a person with an alcohol issue would be braced to deal with. It’s inevitable that some of our customers will have addiction issues. We expect businesses such as betting shops to take steps to protect customers with addictions. Do all businesses have a similar duty of care? When it’s out of context like this it feels like an ambush and it got me thinking about the ethics of such competitions. I’m interested in what you think. Was this a good marketing move? Is it ethical to surprise customers with an opportunity to gamble or participate in a lottery? Would it be different if the customer did not need to take action by buying a ticket? By the way I declined the offer but it did make me wonder if it’s a sign that I’m spending too much on cosmetics! Are Lidl merchandisers not considering the message they are sending? The toy shown in the picture is in the current Lidl catalogue along with a number of really charming wooden toys. But what were the Lidl buyers thinking? Concerns about childhood obesity and the accompanying health issues such as diabetes dominate the media. Parents are struggling to contain the amount of ‘treat’ food their children eat against a background of constant bombardment of advertising of such food and constant availability at rock bottom prices. I remember loving toys that mimicked everyday life in the world around me. I wanted a cash register like the one in the supermarket and I really liked my dolls’ house (even though I had no interest in dolls). My parents even got me a real second-hand typewriter (cheaper than a toy one I suspect, if not perhaps free!). I would have loved a toy shopping trolley with toy packets and tins. A number of toys in the range offered by Lidl seem to do this mimicking of life really well. But making an image of fast food chain burger and chips a symbol of everyday life is I think a step too far in normalising them as every day food. 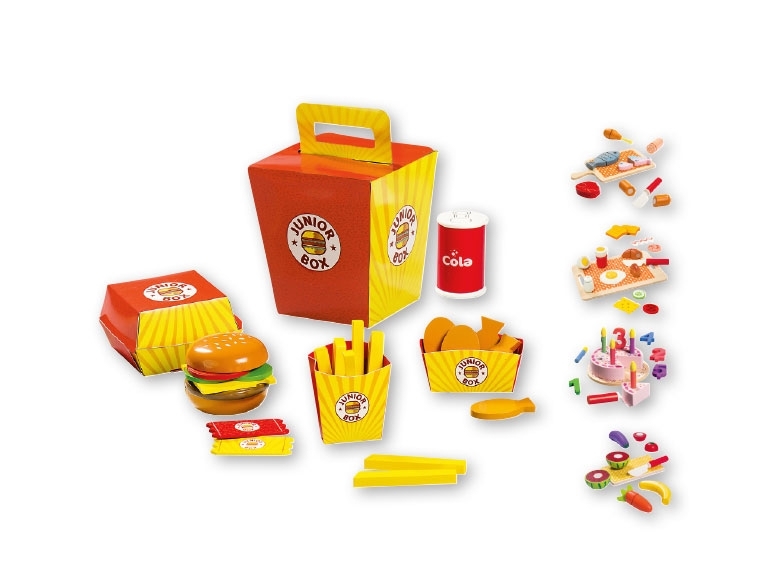 The colours of the toy also mimic those of the most well known provider of such food. It is hard to look at the picture without those golden arches coming to mind.If Lidl want to be seen as providing the means of sustenance and healthy food for families surely this jars and sends out the wrong message. Have they considered their responsibility to the families who are their customers? Have they considered their responsibilities to children and the implicit message being sent to them? One of the other offerings is a representation of a cake. Why do I not have a problem with that? Well that is represented as a birthday cake which is clearly linked with special days and celebration rather than the everyday. So what do you think? Am I a killjoy who is overthinking this? Or do you see this as an error of judgement by Lidl?